Roulette originated in France, yet French-style games are few and far between at land-based casinos in the 21st century. Luckily for us, roulette players can find a number of traditional versions of the game at our trusted casino sites, including several titles which use the advantageous half-back rule. How are French and European roulette different? French and European roulette games have much in common: both feature a single-zero wheel, both offer a standard house edge of 2.70 per cent, and both are becoming increasingly inaccessible for regular punters at brick-and-mortar casinos. So, when it comes down to it, is there any real difference between the two? Nevertheless, the betting options are the same in both games. Black (noir), even (pair) and high (passe) are on one side, while red (rouge), odd (impair) and low (manque) are on the other. Then there are the dozens bets: P12 for the first dozen (premiere douzaine), M12 for the second dozen (moyenne douzaine) and D12 for the third dozen (dernier douzaine). The column bets (colonne) are the same as on a standard European or American layout. Rarely seen outside the VIP parlours these days, the half-back and imprisonment rules are the most important features of a genuine French roulette game. For whereas standard single-zero roulette offers no insurance for even money bets, these special conditions give the player a chance to square the ledger should the spin result in a zero – the one pocket not included in any of the outside options. La partage – Half the initial bet is lost, but the other half is returned to the player. The term ‘la partage’ literally translates as ‘the sharing’. En prison – The player can choose to let the bet stay ‘in prison’ for the following spin. If it then loses, the croupier claims the money; but if it wins, the whole stake is returned to the player. Statistically there is little to no difference between whether you take half your bet back or whether you leave it in prison, which is why the simpler la partage option is the more common of the two rules. Roulette offers a number of specialty bets that are not listed on the game’s pay charts. These ‘French bets’, as they are often called, consist of specific inside wagers that cover certain sections of the wheel. Despite the name, these wagers aren’t exclusive to French roulette. Popular options such as voisins du zero (neighbours of zero), tiers du cylindre (thirds of the wheel) and orphelins (the orphans) are readily available in most single-zero variants of real money roulette, especially in web-based games which use the supplementary ‘racetrack’ layout. Where the rules on even money wagers are identical, the player’s odds of winning at French roulette are no different to those in European roulette. All wagers carry a 2.70 per cent house edge – the standard casino advantage for single-zero roulette games. When half-back or en prison rules are in play, however, things get very interesting. Because these rules mitigate the effect of the zero, which is the sole source of the casino’s advantage on outside bets, they cut the house edge down to only 1.35 per cent on even money wagers. Thus, when the casino gives you half your bet back, it is also handing over half its advantage – and that’s why you don’t see these rules in action much anymore. Unless you have stacks of cash and can afford a VIP membership, your chances of finding French roulette at a land-based Australian casino are slim to none. Joints like Crown Melbourne, The Star and Jupiters are already phasing out single-zero tables in favour of US roulette and its higher house edge, so it’s fair to say that value and quality aren’t at the top of their agendas at the moment. The easy solution is to play roulette online at one of our recommended, trusted online casino sites. There are plenty of single-zero games available for real cash play on desktop and mobile, including French variants with the half-back rule in play. We only recommend casino operators that source their games from licensed software providers, so you can be certain of enjoying a safe and fair online gambling experience. Our top-ranked roulette casinos all accept Australian dollars and offer some huge bonuses for new players. Hit any of the links above to sign up and get started. Whether you prefer digital games powered by random number generators (RNGs) or live dealer tables with real-time video streaming and professional croupiers, you can find online roulette with French-style layouts at many of the best real money casino sites for roulette. Below are a few of our favourites. Widely regarded as the creme-de-la-creme of live dealer roulette operators, Evolution Gaming has something to suit every type of player. Live French Roulette Gold is perfect for those seeking a traditional-style game with luxurious surroundings and eye-catching dealers, while Live Auto Roulette offers a faster pace of play and affordable betting limits. The best part: both games can be played with la partage rules. It may be an old stager, but Microgaming remains one of the most trusted and respected software providers in the online casino industry. 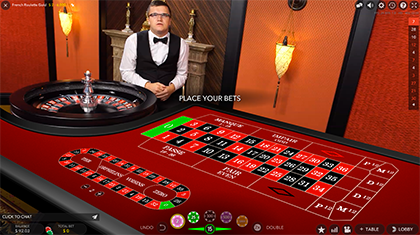 Not only does the Isle of Man firm’s simply named French Roulette deliver exactly what it promises, it is also one of the very few digital roulette titles that uses the half-back rule. It may not look as fancy as the Gold Series games, but the 1.35 per cent house edge is worth it. NetEnt roulette games are staples of instant play casinos such as Guts.com – our top roulette site for Aussie players. The Swedish brand offers two French variants: one with a standard casino-style layout and adjustable bet limits, and another with a more modern, intimate visual display. While neither offers la partage or en prison, the ability to bet anywhere from $0.10 to $10,000 per spin on French Roulette Pro makes it ideal for high-stakes gamblers who prefer RNG play over live dealers.